Nikki took a simple kids song and created a splashing good time! Her illustrations are simple, yet fun. The frogs on the page pop out at you as in a collage scene. I loved their long pink tongues when they were catching bugs. 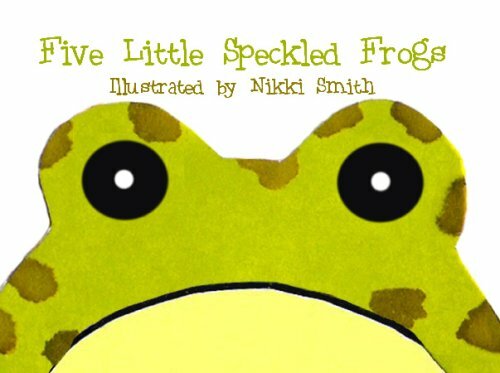 The only thing I wish was that Nikki would have made a different drawing each time a frog jumped into the pool (where it was nice and cool !) rather than reusing the same one each time. I think it would have been more creative to add them jumping in differently. I just love sitting and singing the song with my little ones and showing them the book as I showcase this great song for a new generation!